Is there anybody out there who doesn't like a bit of chocolate now and again? Didn't think soIndulge your sweet tooth with this great collection of chocolate items from Bloomex. Our Chocolate Supreme Gift Basket features an assortment of 14 items, from Belgian Truffles, to Premium Cookies and Coffee. 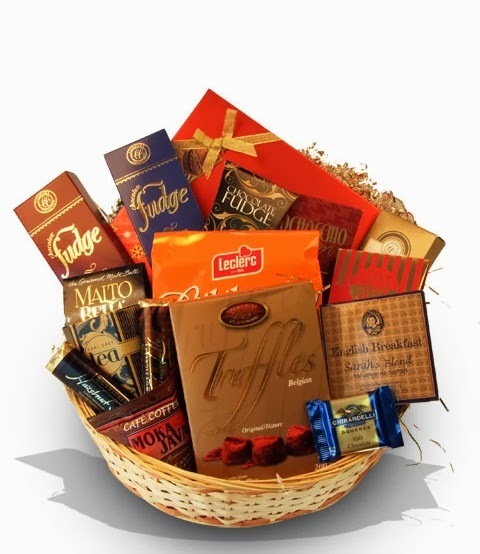 Your gift is carefully hand-packed and delivered in an attractive gift basket with your personal message. This basket contains 14 mouth watering items: extra large box of premium chocolate, assorted Belgium truffles, extra large box of Belgium truffles, large box of private brand fudge, chocolate truffles, large box of chocolate cookies, dark chocolate, private label chocolate, premium truffle assortment, milk chocolate, premium cookies, assorted premium tea, English tea assortment and premium coffee. Is there anybody out there who doesn't like a bit of chocolate now and again? Didn't think so. Indulge your sweet tooth with this great collection of chocolate items from Bloomex.